How to export from Illustrator to Photoshop and preserve the artboard structure? The app zeplin.io is a tool that provides developers with information about a design, such as positioning and colors. But it works exclusively with Photoshop and Sketch. I would like to know if there is a way to take an Illustrator file with artboard, export it to a Photoshop file with artboards, and then import it to Zeplin. To convert an AI file to PSD simply click File > Export As... > PSD. 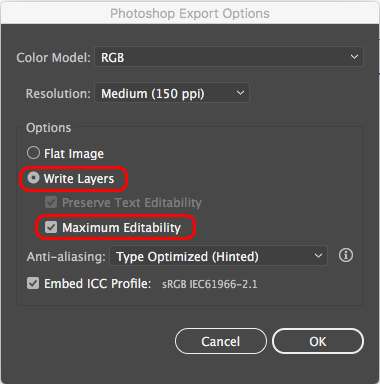 In the Photoshop Export Options pop-up menu, select Write Layers and Maximum Editability then click OK. After that open this file in Photoshop. Not the answer you're looking for? Browse other questions tagged adobe-photoshop adobe-illustrator export artboard or ask your own question. How can I export a PDF from Illustrator with pages named after the artboards? How to create filters in Photoshop and export for iOS/Android? How to reflect objects on one artboard onto another in Sketch? How can I export AI file to various sizes? Why colors change when I export from Illustrator to Photoshop?